SafeGround strongly condemns the attack this week on the Mine Detection Centre, a non-government de-mining organisation working in Afghanistan, which has left eight de-miners dead and another three injured. The Mine Detection Centre staff were targeted by an unknown group on Monday, June 10, while undertaking a mine clearance project in Logar Province. “Mine detection and clearance is a vital humanitarian undertaking in Afghanistan. To target those who put their lives at risk to make their country safe is both senseless and dishonourable.” Lorel Thomas, National Coordinator, SafeGround. The Mine Detection Centre is humanitarian organisation that has been actively clearing landmines throughout Afghanistan since 1989 as the implementing partner of Mine Action Coordination Centre of Afghanistan (MACCA). The attack has been strongly condemned by the MACCA, the International Campaign to Ban Landmines and the United Nations Assistance Mission in Afghanistan. MACCA emphasises that the Mine Detection Centre de-miners are civilians working to remove explosive remnants of war to make Afghanistan safer for the population. Afghanistan, as a signatory to the Ottawa Convention on Landmines, has destroyed all its landmine stockpiles and no longer imports or uses these weapons. 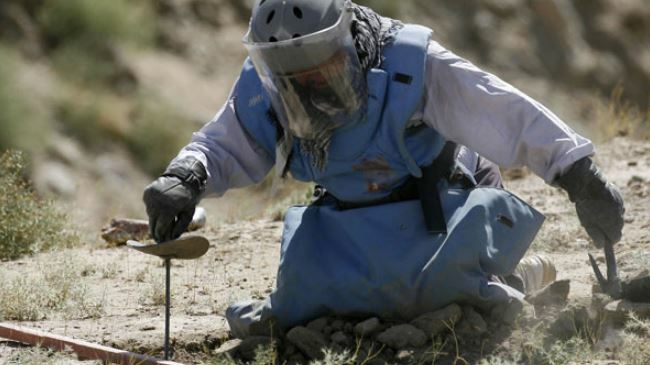 Nevertheless, after over 30 years of conflict during which landmines and cluster munitions were used indiscriminately, Afghanistan remains one of the world’s most heavily contaminated countries of explosive remnants of war. The 2013 Landmine Monitor country report estimates over 270 square kilometres of land is littered with antipersonnel landmines out of a total of 521 square kilometres contaminated by explosive remnants of war. Recent figures show a steady decline in the number of hazards due to the tireless efforts of de-mining workers. SafeGround extends its condolences to the families of the eight de-miners killed and a fast recovery for the three injured.